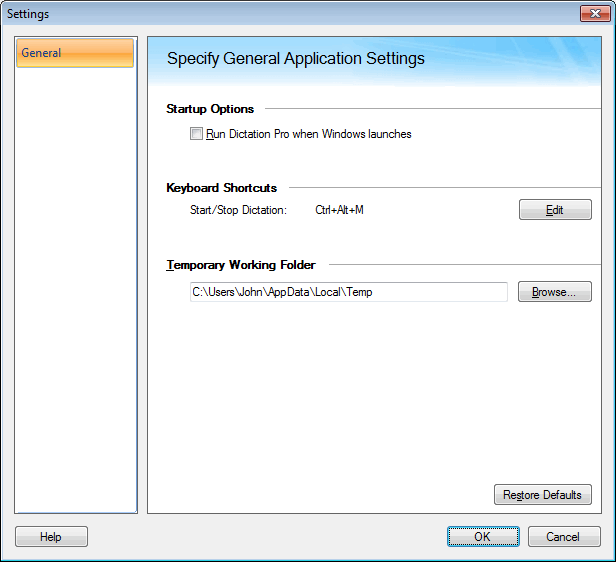 For effective use of the program, you can configure the application settings. The startup options instruct to perform certain operations when you start Dictation Pro. You can choose to run Dictation Pro when windows is launched. You can start or stop dictation from keyboard. The default keyboard shortcut is Ctrl + Alt + M. You can change the default settings by clicking Edit button. If you change the default, select a hot key combination that can be easily remembered. Select a key combination and click on the OK button. The selected hot key is used to start and stop dictation process. Note: The Hot key combination should have minimum two modifier keys [Ctrl, Alt, Shift] with Alphabet (A to Z) or Function keys. Eg: ”Ctrl + Shift + F" or "Alt + Shift + A" or "Ctrl + Alt + F11"
The files created during dictation are stored in the temporary working folder. Since the files are temporary, they are deleted from the folder when the dictation is complete. The location of the temporary working folder can be specified with the Browse button. The folder must be located on the drive having enough free space.